Typically made as an "Old World" or traditional Salami, Crespone sausages are considered to be "artisan" or "farmhouse" types of dry Salami made from centuries old recipes. Crespone is the term used to designate a dry sausage from meat stuffed into the irregularly-shaped colon casing that is then allowed to be cured. 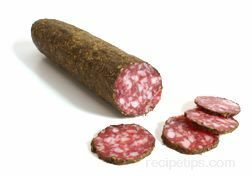 Crespone Salami most often will be made from coarse ground pork that is blended with sherry, garlic and seasonings to provide a rich red color and a delicately sweet flavor. The meat may be lightly smoked, then cured and air-dried. During the processing, this type of sausage may contain cooked meat or uncooked meat that is cured for eating by fermenting and air-drying. The casings of many Old World salamis are often allowed to mold on the outside, producing a non-harmful dusting that coats the casing in a white powder, similar to the process of curing various cheeses. The mold creates enzymes that help tenderize and flavor the ingredients within the meat. 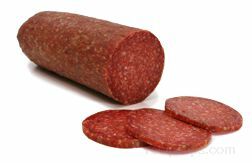 Crespone Salami may also be referred to as "crespo" salami.